In SAP Screen Personas, developer can use Script Button to call WebRFC from SAP system to send and recieve data as import export parameters of a ABAP function module. In this SAP Personas tutorial, or we can think as an ABAP tutorial on WebRfc, I will explain how ABAP programmer can create a webrfc function module and call WebRfc using a script button. ABAP developers can create WebRFC function in the way that a function module is created using the ABAP editor. WebRFC function module is created as a normal function module, it does not require to be remote-enabled function module. So WebRFC does not mean remote RFC. To demonstrate how script button is used to call WebRFC from a SAP Personas flavor, in this tutorial I'll share source codes of a WebRFC which returns current SAP username and user's fullname. To make it easier, call SE37 Function Builder transaction code as the initial start point. I gave the name "ZEY_Personas_UName" for my sample WebRFC. WebRFC function module does not use Import and Export parameters, instead it uses Changing and Tables parameters for parameter value exchange during calls. So leave import and export parameters tabs unchanged. Among these W3Param parameters, CONTENT_TYPE stands for HTML content type. CONTENT_LENGTH is for HTML content length and RETURN_CODE is for Return value of a Web-callable function module. These parameters are for webRfc usage from web and sets related HTTP protocol related data. ABAP programmers will not make any change on these parameters. The Tables tab for table type parameters is actually the place where we read input values using Query_String parameter. And return or export parameters in HTML format using HTML or MIME table type parameters. Below ABAP developers can find the full source code of WebRFC or function module implementing a special interface which enables SAP users to call and execute ABAP function module from web. DATA htmldoc LIKE LINE OF html. INSERT htmldoc INTO TABLE html. Please note that especially for the ABAP programmers, above ABAP function module as a WebRFC does not read any input parameter from the query string. If the application passes input parameters using the query string attached at the end of the URL, to read the query string parameters following code can be used. READ TABLE query_string WITH KEY name = lv_parameter_name. Before calling WebFRC from internet like using it on a SAP Personas Call WebRfc script button step, ABAP programmer has to release the function module to internet using SMW0 transaction. Otherwise users will experience Function module is not released for the Internet error message. Please refer to ABAP tutorial how to release function module to internet to prevent this SAP error on your applications. Before you call ABAP WebRFC from a web browser for test, be sure that the service "webrfc" is active. If the service is not active, Activate Service by using context menu with a right-click on the webrfc node. To test WebRFC on a web browser to see how WebRFC is called and what is the output in HTML tables parameter, you can call the following URL but with your system variables. If you named your WebRFC using a different name, replace the part after "_function=" which is the key for function module. 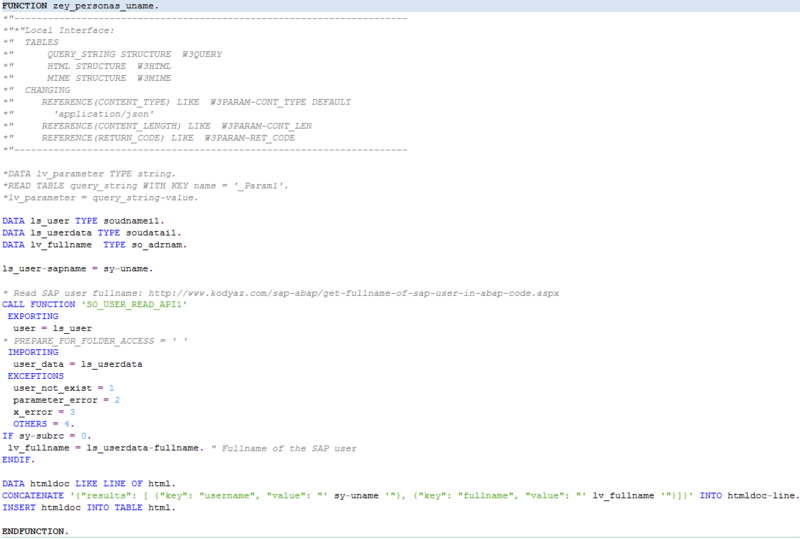 As ABAP developers will see immediately, the output as HTML is in .json format keeping key-value pairs of data. On SAP Screen Personas flavor, using the Manage Flavor icon switch to Edit mode and place two text boxes and a script button on to the layout. As you can see the keys are username and fullname, and json data provides corresponding values. These values are reachable easily from script button "Paste Value" scripts. Let's start scripting now in SAP Personas' way. First step is Call WebRFC. Provide the WebRFC URL address to the script step. Second step is to read the fullname value from WebRFC returned .json data and set it as text value of the textbox. This step reads fullname key value from .json result data set and links the fullname value to the text box. Thirst step is similar to second one with one difference. This steps reads the username key value and links the value to the other textbox. That was all for the SAP Personas script button executing the WebRFC and displaying key values on text boxes placed on the flavor. When I press the script button titled "Get Current User" the outputs sy-uname and full name of the SAP user is displayed on textboxes.